As we wade through a long line of international economic meetings--G20 ministers of finance last week, G20 heads of government in Pittsburgh coming up, IMF-World Bank governors meeting in Istanbul early October (and all the associated “deputies” meetings, where the real work goes on)--it seems fair to ask: Where is regulatory reform of our financial system heading? Long documents have been produced and official websites have become more organized. Statements of principle have been made. And the melodrama of rival reform proposals has reared its head: continental Europeans for controlling pay vs. the U.S. for raising capital vs. the U.K. not really wanting to do anything. But what does all of this add up to, and what should we expect from the forthcoming summit sequence? This is a sophisticated delaying action and you are seeing masters of economic policy spin at work. When something goes wrong on a colossal, global scale, here’s the playbook (e.g., as applied to capital requirements). Agree that there is a problem, but be very vague about it. “It’s complicated” is a good watch phrase. State some completely bland principles to which no can object. By all means, have a spat with the French or Germans. But then patch it up amicably at the big summit; agree to do a bit of everything, in principle. People are wowed by your leadership. Send the job of formulating technical details to a committee of experts, asking them to report at the end of 2009--and then make adjustments through the end of 2010. Rely on the experts to produce a report of mind-numbing detail, which few really understand. The experts know their job and will deliver. Provide leaks of this work and your “true feelings” to sympathetic reporters. They will help declare victory against great, albeit vaguely specified, odds. 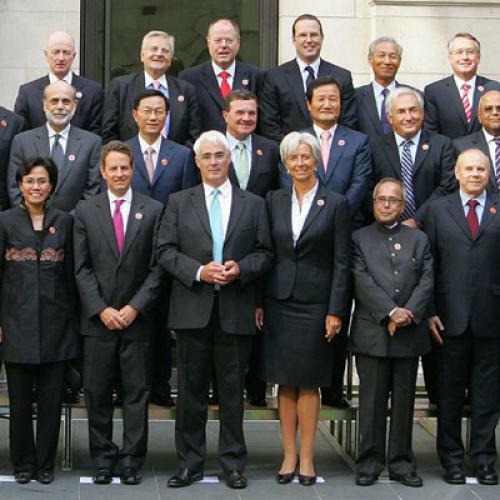 At this point, it’s 2011 and either (a) new people are in power, or (b) other things have gone sufficiently well that everyone has forgotten about the financial fiasco of 2008-09. And, in this context, the point of a G20 or IMF meeting is to have the world’s economic policymakers show mutual support. After all, our opinion leaders reckon, if everyone is on board, then this must be the right way to go. There will be some minor changes, and these will be much trumpeted. But what will really change in or around the power structure of global finance--as it plays out in the United States, Western Europe, or anywhere else? Nothing--and you know this because otherwise the CEOs of all our top financial institutions would be mounting massive PR campaigns against the proposals, with op eds, Internet ads, innumerable cable appearances, and a virtually constant presence at Treasury. Just think back to how active they were earlier this year, when FDIC-type resolution for big banks was on the table. Unless and until our biggest financial players are brought to heel, we are destined to repeat versions of the same boom-bust-bailout cycle. If you find a government willing to state this problem clearly and really take action to confront the relevant powerful people, let me know.